The Notice of Overall Pilot Execution of Transforming Business Tax into Value-added Tax — titled Caishui  No. 36, B2V Reform — was jointly issued by the PRC Ministry of Finance (MOF) and the State Administration of Taxation (SAT) on 18 March 2016. The circular, effective from 1 May 2016, announced the expansion of Value Added Tax (VAT) to several key sectors, including real estate and construction, financial services and insurance and lifestyle services (such as hospitality, food and beverage, healthcare and entertainment). Business Tax that most service industries were subject to prior to the reform will cease to exist and VAT will apply to all goods and provision of all services in or to China. B2V reforms serve to unify all sectors within an undisruptive VAT system, providing incentives to distribute taxes down the VAT chain; ultimately, according to a report by China International Capital Corp. Ltd. (CICC) cited in China Daily Asia, it is estimated to save businesses an overall RMB 900 billion (approximately 0.4% of China GDP) once all businesses have transited into VAT. The VAT rates are differentiated for ‘general VAT taxpayers’ and ‘small-scale VAT taxpayers’. Taxpayers with an annual turnover exceeding RMB 5 million are required to register as a ‘general VAT taxpayer’; whilst taxpayers with turnover under RMB 5 million may register as ‘small-scale VAT taxpayers’. Small-scale VAT taxpayers are not eligible to claim tax credits and can only issue special VAT invoices through the tax authority. General VAT taxpayers may claim input tax from small scale business through special VAT invoices, issued by the tax authority (Table 1). * Certain entertaiment services subject to 3% – 20% rates. 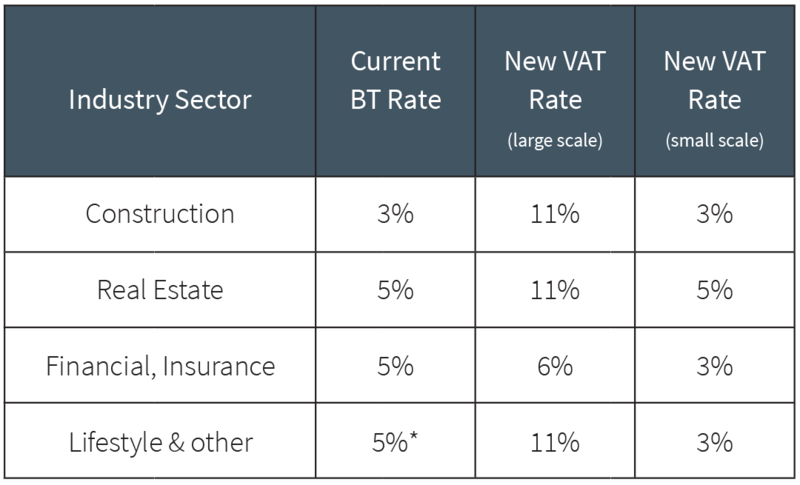 Construction and real estate stand to be the most significantly impacted sectors with VAT applying to all transactions across real estate and construction (leasing and sale of immovable properties, a sale of land use) at a higher rate than the previous BT. However, since VAT is assessed on a net basis, businesses can utilise input VAT credits to relieve tax burdens. There is also a transitional policy to ensure a smooth implementation. Construction projects commenced before or on 30 April 2016 may elect a reduced rate of 3% VAT on gross revenue. Equally, immovable properties acquired before or on 30 April 2016 may apply a 5% VAT on the total sales amount minus the purchasing cost. The B2V reform imposes stricter compliance regulations and is a more complex tax administration. Companies should be VAT registered, purchase VAT invoices machines, implement VAT invoicing management and place contractual obligations for valid VAT invoices in order to claim input VAT credit on time. In the case of mixed sales where businesses are operating with different tax rates, the highest tax rate will be applied unless each VAT-able activity is accounted separately. In theory, the changes aim to discourage cash transactions and off-record dealings, regulate business transactions, improve market efficacy and relieve tax burdens across all industries. The consensus largely is that the expansion of VAT to all financial services (including interest income) and real estate transactions puts China in the category of one of the world’s most advanced tax systems. If the implementations prove successful, other countries may follow suit. Post by Li Huajing, Horizons China contributing writer and editor to The Square. If you would like more information about taxation in China, China VAT or other corporate issues, email us at talktous@horizons-advisory.com, and we’ll have a Horizons professional contact you.